NO REPRO FEE: DUBLIN: 12.07.12: Nightline, Ireland’s largest independent delivery service, today launched Parcel Motel - a brand new and innovative service for anyone who shops online. 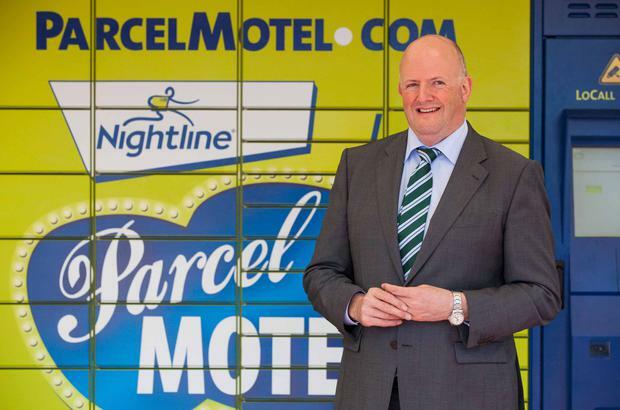 Pictured at the launch of Parcel Motel was John Tuohy, CEO, Nightline. Nightline Parcel Motel allows consumers to have their goods delivered to a location that is convenient for them to collect at any time of the day or night through a network of self-service parcel terminals. To find out more about the new service or to register for an account, visit www.parcelmotel.com. Picture Conor McCabe Photography. Logistic and delivery service Nightline has created 150 new jobs as part of a €3m investment by the firm. The investment comes as the company expands its premium services, which include same day, evening, and weekend deliveries. As a result of the spend Nightline has opened three new depots in Swords in Dublin, Omagh in Tyrone, and Kilbarry in Waterford. The new positions, which include roles for delivery drivers, depot support staff, and sortation shift staff, whill be spread out across Ireland. Nightline founder John Yuohy said the company continues its expansion after nearly 25 years in business. "With the heavy demand for online shopping we are seeing a strong and steady need for parcel and delivery services and this expansion is in line with the desire to continually give our growing customer base a first class service." Jobs minister Mary Mitchell O'Connor welcomed the news. "Indigenous Irish businesses such as Nightline are important to not only the national economy but also local communities, delivering a valuable economic contribution across the country through increased employment and local expenditure.